Lotus is a beautiful game with a satisfying hook. It’s perfectly enjoyable but a bit too safe to really blossom into more than that. We gave it three and a half stars in our review. We have enjoyed our time with it but we won’t be putting down our roots in its soil. Never mind that though – it’s time for us to branch out into our accessibility analysis. We’ll see whether we can recommend it more strongly on that basis or whether we will need to nip the whole thing in the bud. I’m writing this at 3am in the morning because I can’t sleep while the church bells of Middlesbrough are ringing. And they are ringing. Every. Fifteen. Minutes. It’s enough to turn an atheist into a believer just so he can get really angry at the seeming neediness of the Almighty. I’m really not bringing my A game to this teardown, is what I’m saying. Let’s just get on with it. Assessed at a distance, the symbols can be hard to make out and players will need to get up close to see for sure who has control over the flowers in play. That’s important because, as we pointed out in the review, a lot of the tension in the game comes from uncertainty over when someone is going to make a big play to lock down a tempting prize. Leaning in close to look at a flower could be indicative of this and as a result has the potential, although not the inevitability, to leak gameplay intention. There will often be a significant number of cards spread on the table and knowing who is most in control of each is useful to be able to tell without too much hassle. That’s probably not going to be possible in the majority of cases. It’s all just a bit cumbersome in a big game with lots of flowers and lots of players although it doesn’t stop the game being playable. We’ll recommend, just, Lotus in this category. Just bear the potential difficulties in mind. You are making use of a hidden hand of cards, although for the most part there is a considerable degree of visual difference between the different flowers. If a player has some degree of ability to discriminate visual information the large vibrant colours are likely to be a considerable accessibility boon here. There are two cards though where that’s not true – I don’t know what the flowers they represent are actually called but they are both predominantly pink and differentiated by petal shape, background colour and the prominence given to the centres. 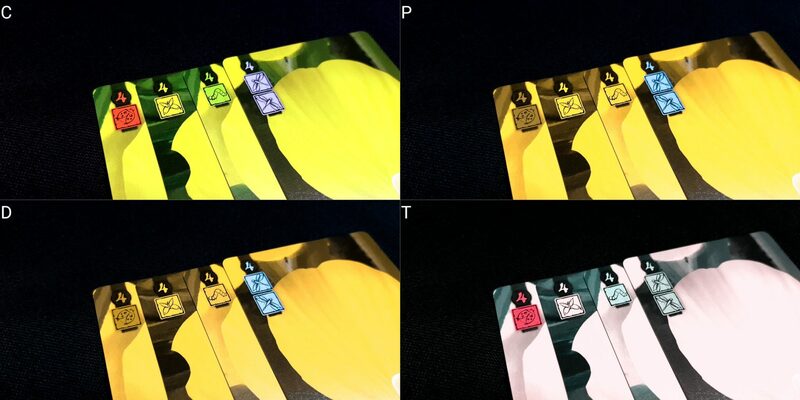 It’s not that they’re particularly easy to mix up for sighted players, but rather that the percentage of the card that is approximately the same colour is going to add a burden of disambiguation onto a player with visual impairments. Each card comes with two pieces of information in the top left – the number of that kind of card in a full set, and the number of control markers the card permits. Wildflowers will have no control markers but each of your own cards will have one or two. Some cards then are inherently more powerful than others and as such a player will need to decide which of the cards in their hand might be most appropriate for a given situation. It’s not just a case of telling flowers apart but telling apart cards of specific flowers too. Only one of each flower is going to be in play at once and that actually constrains the game state considerably – you need to deal with your cards as they map onto a set of opportunities on the table, but you never need to weigh up different destinations for them. What you need to do is be able to mentally project beyond the point a flower is completed because that’s what will determine the importance of the cards you might want to keep. If you can complete a card with a wildflower and still claim its bonus you’ll want to save your higher control cards for the new flower you can start with your next action. 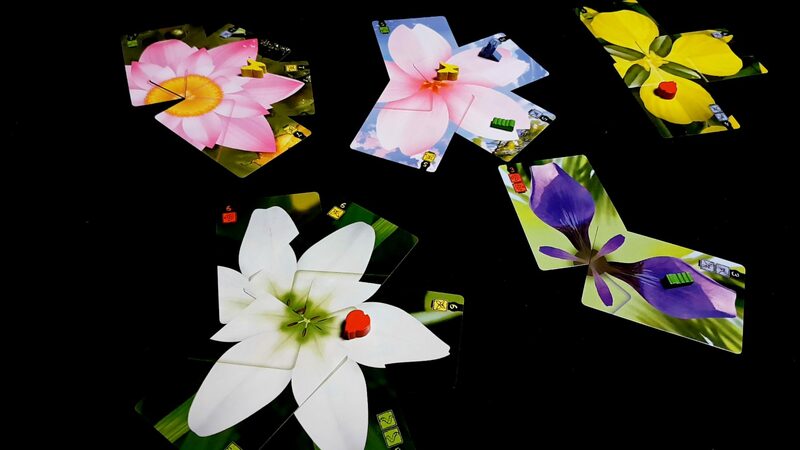 The game permits a fair amount of verbalisation of game state – there are five different kinds of flowers and they can be condensed into meaningful descriptions. ‘The yellow flower has two petals out of four, with red currently in control with a single point’. 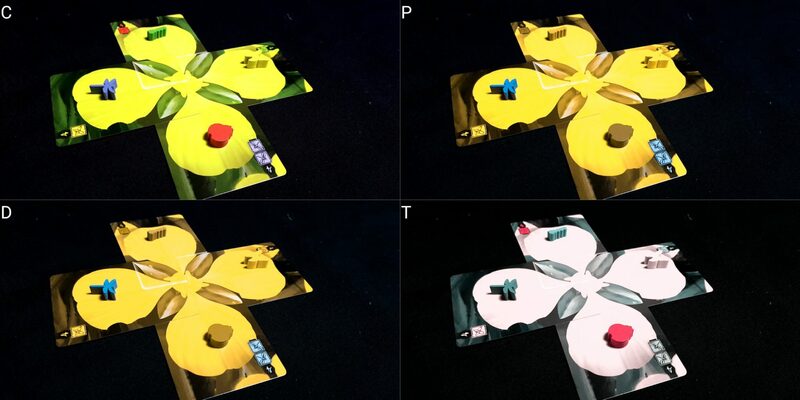 Asking specifically of a flower will perhaps leak gameplay intention but a table can adopt a convention of verbalisation and summary because of the relatively small number of moving parts in play. ‘I played two cards to the whiteish flower. It has three petals out of six and I have control with six points’. A full summary at the start of a visually impaired player’s turn would bring a lot of the game into playability for even the totally blind. It comes at a cost, of course, but the cost may be bearable – it depends on an individual player’s memory more than anything else. Of course, that doesn’t solve the problem of in-hand identification of cards but it does mean that if that’s a fixable problem the game itself doesn’t necessarily get in the way. There is also an interesting feature here with regards to how the cards get played down. There is a outline on each that shows where the next card in the set should be placed – the contrast on that is low but arranging cards properly can be a function of the table rather than any individual player. However, it also leads to game states that are both striking in their colour and relatively distinctive in their layout. Depending on the degree of visual information to which a player has access this might alleviate some of the verbal burden. The shape of cards when played out gives important game state information. 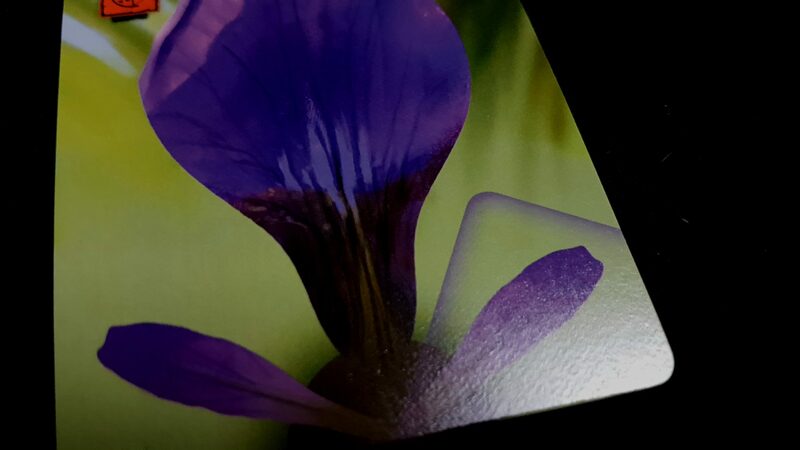 You know very well for example how close a three-card purple flower might be to completion. The more cards you have in a set the harder that is but it can nudge the memory burden in a more agreeable direction if using card shapes is something that is feasible. Guardian tokens are identifiable by their tactile profile, and their availability for a player can be assessed by touch. In any case, all they do is add a point of control to a flower and so their presence can be incorporated into a verbal summary of game state. The main point of inaccessibility then is the hidden hand of cards you possess and the extent to which the design of the cards is going to permit someone to make meaningful decisions regarding what options they have. Play with support from the table for this element isn’t feasible because of how much importance is bound up in your ability to surprise people. We’ll recommend Lotus in this category for those with minor to moderate visual impairments, but those with more serious impairments may find it a more challenging proposition to play effectively without dedicated support. 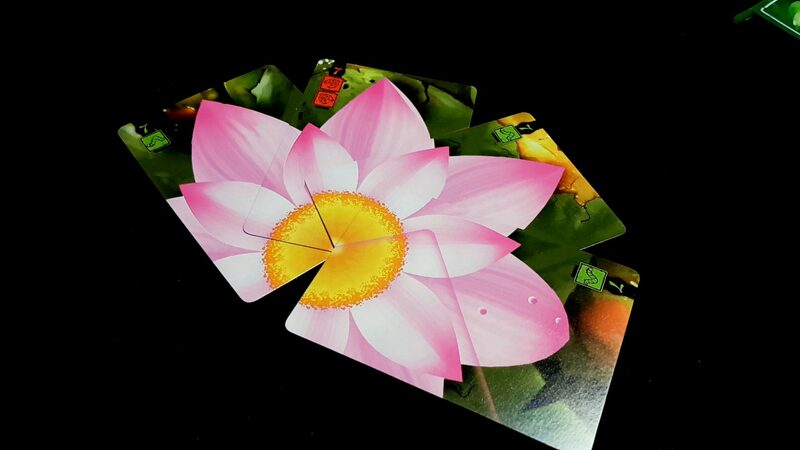 Lotus is not excessive in its numeracy expectations because all the numerical aspects map onto physical elements – orientation of cards, stack of collected petals and so on. However, as is often the case, it does depend on a deep appreciation of the more intuitive maths of probability. Play is strengthened considerably too by an explicit consideration of probability. A lot of working out the risk to a flower in contention is knowing what cards a player can have left from their hand and keeping track of that will lead to better play than trusting to instinct. Generally though a simple heuristic will permit effective play – the more times a flower has been plucked the less likely you are to have the cards needed to steal it away rapidly. That’s not always going to be true but following it will take you a long way towards playing to a reasonable standard. The rules of Lotus are straightforward, although the power-ups you can claim as time goes by will add a certain malleability to understanding how the game works. These only impact on the quantities of things, not their meaning. However, they do drastically change underlying risks and rewards. Someone having a hand limit of five versus your four is an asymmetry that leads to some distorted calculations if you approach the game in the same way as if that imbalance did not exist. That said you can play without the power-ups and still have a reasonably fun game – you lose some of your ability to mitigate the impact of luck but the core of the experience is retained while lowering the variability in the rule-set. The guardians play an interesting role here. You can vary the number of guardian tokens that each player has to give you an opportunity to fine-tune the difficulty a little. Perhaps the most skilled player gets none to start with and can purchase one whereas another player gets all three from the very beginning. It gives an effective way to help equalise the odds in situations of mismatched experience and skill. The game state isn’t especially complicated, and the layout of the flowers does a great job in wrapping up a whole lot of otherwise numerate calculations into an instantly intuitive package. You’re only ever worrying about five flowers at most, and simple counting will be enough to show who has control of each flower. The two different kinds of winning a flower do require players to think more laterally in terms of prioritising plays though. If you’re not playing in an overly competitive group where points matter it can just be satisfying to complete a flower without worrying about what it actually gets you in terms of points differentials. If you are playing ‘for keeps’ then every flower becomes a calculation of ‘can I complete and control? If not, who gets what points and what does that mean for me?’. Players in Lotus, in order to do well, are going to need to memorise some elements of the game history. Knowing who has claimed which flowers, and how many cards they expended in the process, is key to telling what risks they present to you for future flowers. It helps a lot to know approximately what resources each player has in their deck and which cards they might be prioritising when they draw wildflowers. Your ability to win a showdown depends on your ability to creep close enough to the point you can complete it and keep control, but not to the point your opponent can do the same. It’s a constant game of shuffling forward until you make a final sprint towards the gate. You feel a lot more confident in that shuffling if you know another player likely only has a single critical card in their deck than if they still have all of them. As mentioned in the review this is a game where sometimes you are weighing up playing one card twice or two cards once. Reaching the point of no return on a flower is sometimes a delaying action while you work out what cards an opponent may have available. That said, you can adopt a convention of displaying collected flowers as open information but to get the same benefits from the layout as you do from active flowers you would need an awfully big table. We’ll recommend Lotus in the fluid intelligence category – it’s amenable to scaffolding, limits the numerate elements of cognitive complexity with clever visual design, and can be inherently satisfying as a simple game of playing and completing flowers. Our recommendation in the memory grade is a little more tentative. With modifications though it could likely be made to work without over-stressing the need for players to remember who played which cards, where, and from which decks. You’ll spend a lot of time in Lotus feeling aggrieved that someone just stole your flower away from you because it almost always happens in a kind of ‘hurry up and wait’ system. Or rather ‘wait and hurry up’. Players will tentatively inch themselves closer to claiming a flower only for it to suddenly be swept away from them in a single fluid motion. Every player has two actions, and each action can play between one and three petals depending on circumstances. As such the only thing that determines whether you are safe with what you’ve done on a flower is likely ‘purchasing power’ in a deck. Every single flower is like one of those horrible penny auctions where every bid you make commits you to a loss. 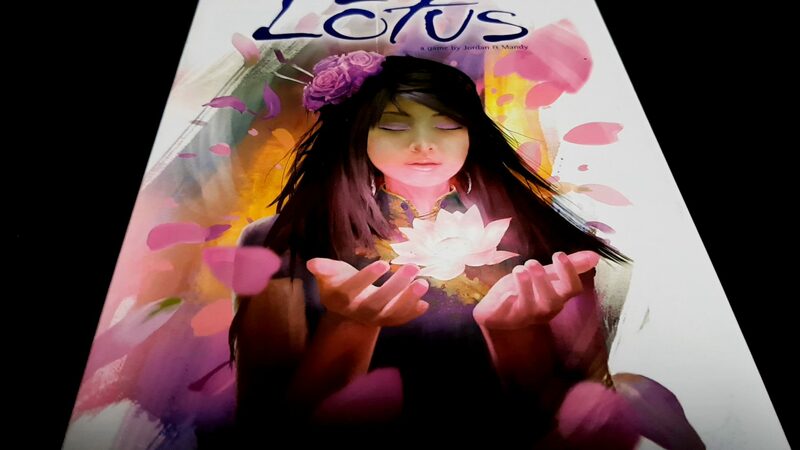 Lotus is a pretty, approachable game but it’s also surprisingly cutthroat. You will occasionally be in a situation where you complete a flower and somehow end up farther behind. That’s still wise to do because otherwise someone can complete and claim the flower and get even farther ahead. It never feels especially nice to be forced into the position of doing yourself an injury though even if it’s the tactically savvy play. You’re never really in the position of people ganging up on you in Lotus but it’s an odd game in that you get all the effect of players going out of their way to lock you out of play but none of the actual intention or conspiracy. It’s just that the way the opportunities to claim a flower come around tend to create convergences of value. You all have some interest in every flower but varying investments in each. That doesn’t stop you seeing what someone else has been working towards and stealing it away as effectively as you can. With every player doing that to every other player it sometimes feels like everyone is ganging up on everyone else. Those with a compulsive need for completion may find this a difficult game to fully enjoy, because flowers will remain uncompleted for significant stretches of time. Often nobody wants to make a flower’s potential completion an opportunity that is available to an opponent. Similarly, players might be prevented from completing a flower that they especially wanted to because an opponent had a chance to scoop it up first. Whether this is going to be an issue depends on the extent and manifestation of compulsion, as it always does, but it’s something to bear in mind. There aren’t any player elimination mechanisms, but the whole game is one big passive-aggressive ‘take that’ mechanic where you are constantly looking to deprive people of the work they’ve put in. The role that theft plays in scoring can lead to very significant score differentials. This is mitigated somewhat by the luck element – everyone is at the mercy of their deck draws – but that also means occasionally differentials can be very high. Having okay cards at the right time is much better than having great cards at the wrong time. The wildflower deck gives you some ability to manage this but not enough to give you any genuine sense of control. Guardians too give you a bit of flexibility, especially because they can be repositioned if it turns out you have over or under invested somewhere. That comes at a cost though and again – if you fall foul of the timing of play you will find even this ability to undo mistakes is frustratingly ineffective. We’ll tentatively recommend Lotus in this category. Accessibility implications here depend on how much direct play of cards is going to be required. 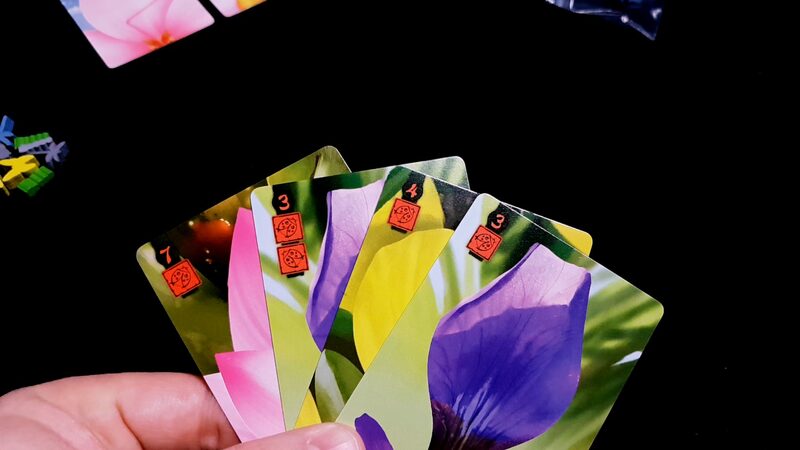 The cards are expected to be played in a fan so as to simulate the flowers they represent, and there are guide lines of the cards that exist to show how they need to be arranged. These are precise and easily disturbed although actually tidying them up tends to become a job for the table. The game looks so pretty that everyone seems to take an ownership over ensuring it remains as striking as possible. However, there is also going to be a considerable amount of repositioning of flowers because the actual layout of a table of cards is going to require people to be good at judging how much space an arrangement will take up. As flowers are collected and new ones started it becomes quite common that whole displays need to be subtly rearranged to make sure played cards don’t overlap. If there are players at the table happy with doing that there isn’t a problem but it does involve a fair degree of fine-grained motor control to do this in a way that retains the appeal of the layout. Truthfully though these are primarily irritations rather than genuinely critical inaccessibilities. They just add an additional burden to play as the layout is constantly curated. If directly interacting with cards is not necessary, verbalisation becomes possible in association with a card holder. Your hand is only ever a maximum of five and you only need to see a portion of each card to make informed decisions. I’m sure the flowers have names that would aid in verbalisation too but I don’t actually know what they are. ‘The purple flower’ or ‘the flower with the big yellow centre’ or ‘the whitish flower’ are all suitably descriptive. Those with more knowledge of botany will undoubtedly be able to be even more precise. We’ll recommend Lotus in this category. There isn’t a lot of gendered art in the game – mostly you’re manipulating flowers and small insect guardians. The cover prominently shows a woman, which is a welcome change from the default. Unfortunately the manual also defaults to masculinity in the text so you know – one step forward, and one and a half steps back. Lotus seems to retail around the £28 mark, and I think it might be a difficult game to justify at that price point. The interest curve for Lotus, at least in my experience, bends the wrong way – it becomes less interesting with familiarity rather than more. The first few floral showdowns are genuinely tense but the more you play the more you see how dependant it is on luck to force genuinely exciting play-states. I’m not sure this is a game with substantive staying power. It’s not that the game is bad value, but rather it represents depreciating value within a game group. It’s obviously very striking and approachable, and worthwhile as a game on your shelf you can pull out to seduce reluctant visitors. I doubt it’s going to find heavy use in a collection otherwise. We’ll recommend Lotus here, mostly for the prominence it gives to a cover that breaks the ‘stern white men’ stereotype of game boxes. No literacy is required for play, although the power tokens do have their effects explained in written text. This is easily memorised though and the tokens are double sided so that they can be separated by graphical design rather than description. No other communication is needed – you can play with all the quiet deliberation and reticence of a council of ents if you like. We strongly recommend Lotus in this category. Colour blindness intersecting with physical accessibility concerns would lead to a situation where close inspection of a layout may be necessary but it cannot be comfortably done. While it’s certainly not difficult for players with a better view on the game state to verbalise any ambiguities it is going to lead to the question ‘but why do you want to know?’. Otherwise I don’t think there are any intersectional concerns here that would invalidate a recommendation grade we would otherwise give. The play time of Lotus is reasonably brisk – games are over and done with in about 15 minutes per player in my experience. That’s barring accessibility compensations. Even in the circumstances that extensive adjustments need to be made to the play experience it’s unlikely the game will last long enough to inherently exacerbate issues of discomfort or distress. If it does, the game elegantly supports dropping out because nothing in play need be redistributed back to the shared state. It might change the risk and reward calculations to know a player won’t be continuing their assault on a flower but it won’t be significantly to the game’s detriment. There are some special rules that are supposed to be followed for three and four player games with regards to deck composition but as long as a majority of the game has already been completed you won’t suffer significantly by the absence of their honouring. The most straightforward games are not always the most accessible – we have too many counter-examples to take into account before we could possibly make a claim of that nature. It’s not a bad way to bet them though. Lotus has a lot of features that derive from its simplicity that lead to it having a reasonably strong performance across the board here. What’s most interesting, at least to me, is that Lotus is a game that manages to use spatiality as a way to reduce some of the cognitive and visual burdens that would have otherwise cost it dearly in this teardown. The laying out of petals in a floral pattern is a nice gimmick that leads to beautiful game states. It’s also a way of providing information redundancy in an intuitive manner. That’s sometimes what accessibility does – brings out the inherent loveliness that comes from presenting things in an elegant way. 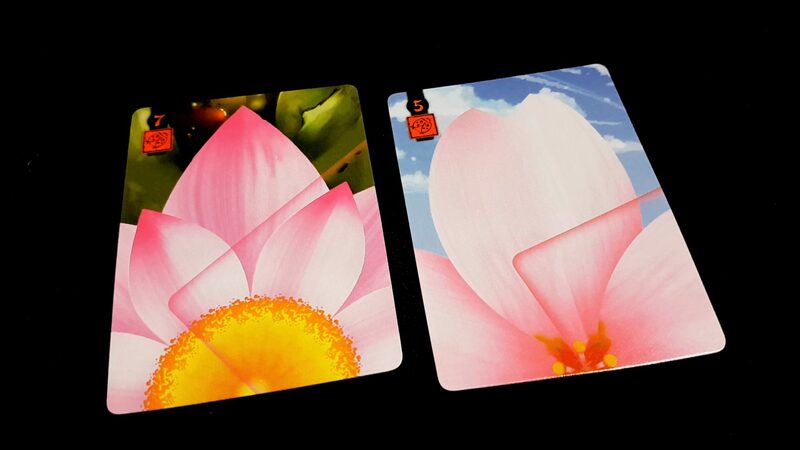 Lotus would have been an uglier, less striking game had it relied on lazier tropes for card-play. 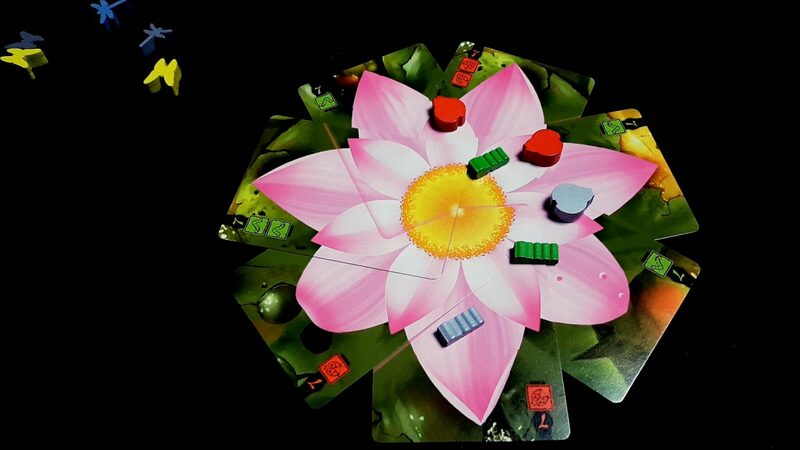 We liked Lotus to the tune of three and a half stars in our review – it’s a good game, we enjoyed playing it, but we also suspect it won’t see too much regular usage in the crop rotation patterns of our board-game collection. I certainly think it deserves your attention if it sounds appealing, and if it does this teardown suggests you have good reason to believe you might even be able to play it.